As expected, Planned Parenthood officials were excited to put their spin on the discovery and are reportedly in talks with the U.N. to have the site registered as a World Heritage Site. We decided to reach out to the president of Planned Parenthood, Cecile Richards, for her thoughts. I’ve included some comments she was able to provide in spite of her busy schedule in red below. It is believed children’s heads were cut off once dead and placed on poles in the entrance as a sign of reverence rather than a warning. High-value personal possessions, including amber beads, precious material, hair rings and bronze rings were also found, and are thought to have been part of the grisly displays. Not sure why biased terms like “grisly” have any place in a serious report like this? But more recent skulls, dated to 200 to 400AD, showed signs they have been severed, indicating human sacrifice took place in the caves. I’m tempted to call this calvarium harvesting, but that’s kinda shop talk. We generally just say ‘family planning’ or ‘inducing fetal demise,’ if one must get specific. 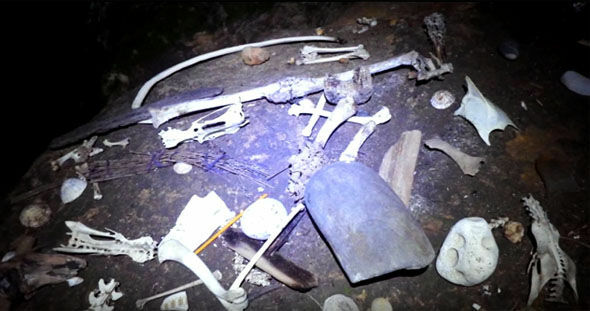 Professor Ian Armit, of the school of archaeological sciences at the University of Bradford who was part of the excavation team, said: “What really sets Sculptor’s Cave apart from other archaeological sites in Britain is the disarticulated human remains. We found 1,800 disarticulated bone fragments there at least. “We could start to tell from the list of parts of bodies left in the cave that they were not representative of what you expect. This could still be a gold mine of compensation per specimen. Someone should get on this. The team has deduced that corpses were brought to the cave to be dismembered and parts such as heads were displayed on poles as some sort of shrine. Always remember, Shrine/Religion in the ancient world = Science. Scientists wear the white robes of infallibility. What’s the take away? It’s clear that these caves provided an essential service to neolithic peoples and being dead, no one can take that away from them. Sorry, gotta run! -C.R.